The Clover Rewards solution is one of the leading providers of mobile loyalty for small & medium-sized businesses and enterprises. 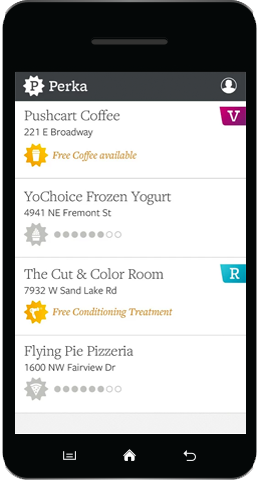 The Clover Rewards solution is a fast, intuitive and friendly solution to mobile loyalty. The Clover Rewards loyalty program helps you identify trends and opportunities as it reaches out to your customers in real time with special offers that you create and control. With Clover Rewards, you can design a loyalty program that is as unique as your brand. So if you want more than just another loyalty program, the Clover Rewards solution delivers! Clover Rewards connects you directly to your customers via their mobile phones, allowing you to run the same kinds of sophisticated marketing programs as nationwide chains-at a fraction of the cost. With Clover Rewards, you'lll bring in new customers and turn occasional visitors into loyal regulars. Your customers will be happy and will keep coming back for more. Clover Rewards is a featured app on the CloverTM Station that seamlessly integrates loyalty with every transaction. With the Clover Station, transactions and rewards are tied to specific customers and tickets, with your customer’s consent. In some cases, you will know their shoppers by name and by what they purchase. You can download the Clover Rewards app on the Clover Station. Visit the Clover Rewards website for more information.